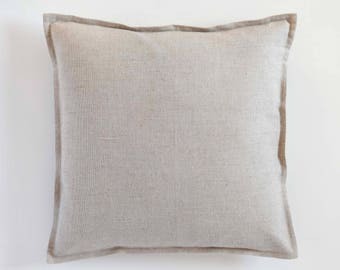 Natural linen vintage style pillow cover. 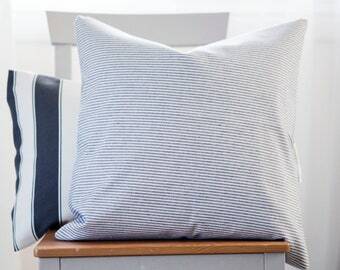 Striped Blue lines with natural linen shade. Stripes width 2cm. 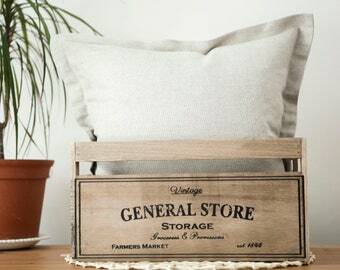 This pillow perfect fits french farmhouse style interior. 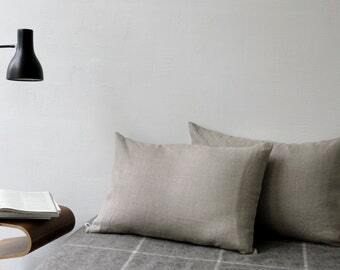 Natural linen pleasant for touch. Suitable for daybeds and for daily use on bedroom beds. Interior designers choose it for Country style houses very often. 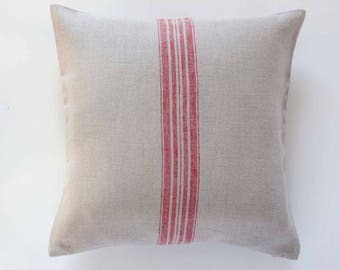 Pillow sewn in home based small studio. Every piece may be sewn in custom size. 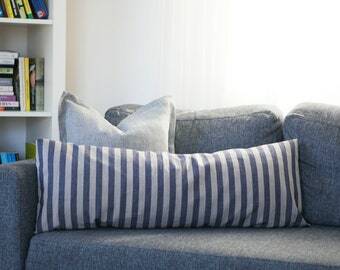 The same fabric is used on both sides of the pillow cover. The closure is hidden zipper on the bottom. All inseams are finished to prevent fraying. 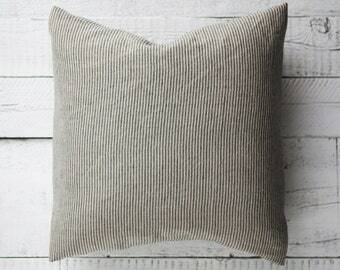 Listing only for pillow cover - insert not included. 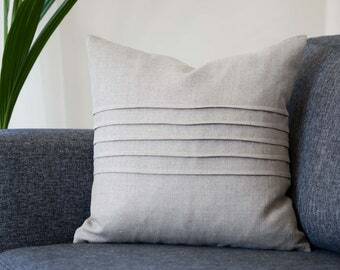 Linen always delights by its strength, durability, and positive impact on human health. EXPRESS shipping available. It is only few dollars more, but you will have guarantee that your parcel will arrive in 2-3 business days after it will be shipped. Every order may be gift wrapped. In craft paper, jute string and gift message added. I am always happy to make something only for you, so do not hesitate to contact me about custom orders. Custom orders can take longer than standard orders, contact me for price and time range, when your order can be fulfilled. I start work on the order only when it is fully paid. You will receive a link to your custom listing with all agreed details and pricing. I do can sew any size pillows. Custom sizes available as well. Table linens also may be sewn in custom size. Contact me for details. I do recommend to wash your new pillowcases prior to placing them on bed for the first time. 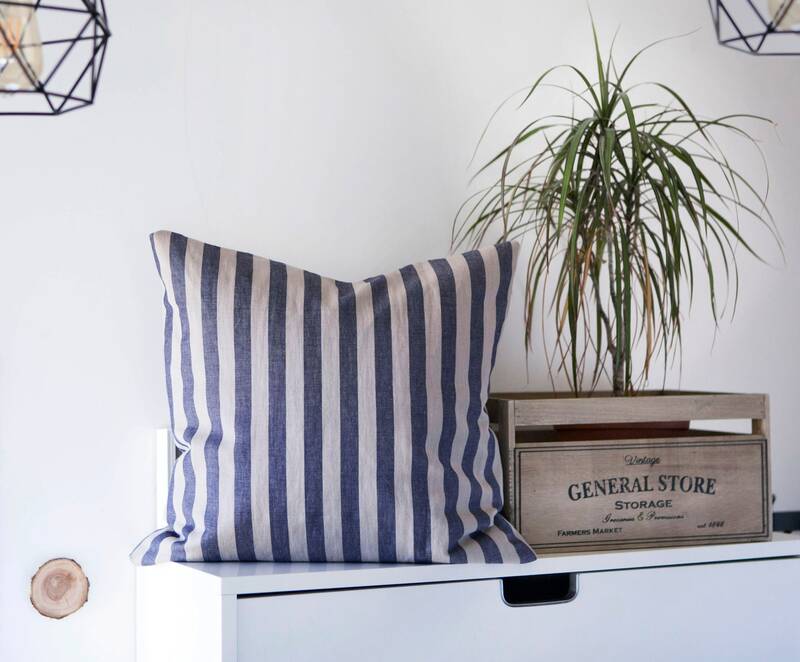 Linen fabrics get softer with each wash. You should stay away from bleaches or fabric softeners because they can damage the fibers or make the fabrics feel more rigid over time. 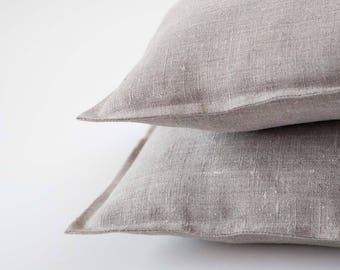 Pillowlink pillowcases may be machine washed and tumbled dry on a medium setting. Once removed from the dryer, iron immediately. I do use mild detergents by my own. 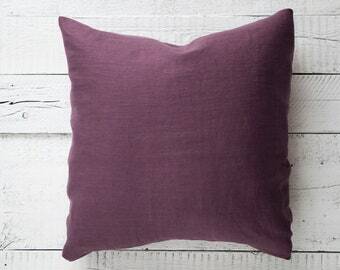 I am happy with washed pillows as well. I do can gift wrap your order. You may select this option during transaction or after purchase leave a message in "message to seller" field. I do can write or print a note with your words. It takes 2-3 business days worldwide to ship via Courier. You can choose express shipping option during checkout(do not forget to take into account the production time). The price for express service is counted while choosing the option. At the moment sewing orders takes about 5-10 business days. If you need your order faster - contact me and I will rush it. No any additional cost for rushing it. Where is my Parcel after 2-3 weeks? It may happen that parcel already in your local post office. Might be you was not at home by delivery. Signature is required for registered mail. You should require for your parcel in local post office with tracking info, provided in order after shipment. I do accept wholesale orders. Please contact me for details. I do can offer discount 15-25% discount. Depends on quantity. Please contact me in 14 days after delivery if you want to return items. 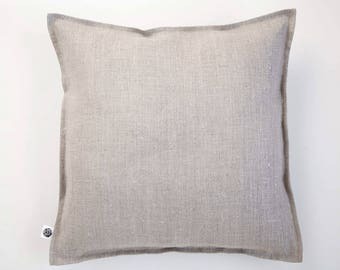 Linen pillow cover, linen sham, linen euro sham, pillow shams, natural linen pillows, king pillowcase, custom size.